A quilted shawl is the perfect thing to wrap a person in prayers -- the pink ribbon block is an encouraging symbol of hope. 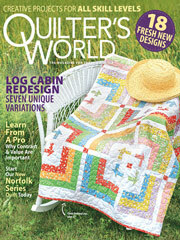 This e-pattern was originally published in Quilters Think Pink. Size: 48" x 24". Block Size: 6" x 6".